Diabetes can result in damage to the eye especially if the blood sugar is not well controlled. People with poorly controlled diabetes are at a much higher risk of this damage occuring. When blood sugar levels are too high this can cause damage to blood vessels in the retina. This can result in vision loss either through bleeding or through loss of circulation to the parts of the eye important for vision. Abnormal new blood vessels grow in the eye which can cause vitreous hemorrhage, macular edema, and even glaucoma. All of these changes from diabetes can lead to permanent vision loss if not treated. •	Noticing colors appear faded or washed out losing vision. Diagnosis of diabetic retinopathy is made by examining the eye with a dilated eye exam. 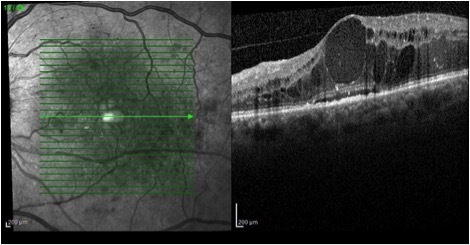 Additional testing such as fluorescein angiography (FA) and Optical coherence tomography (OCT) may be used to determine the extent of bleeding and leakage in the eye. One of the most important aspects of treating diabetic retinopathy is good glucose control and blood pressure control. This helps keep the blood vessels in the eye healthy and sometimes this can even reverse the damage from diabetic retinopathy. Depending on the amount of bleeding or leakage in the eye, several types of medication can be used. Currently, the most commonly used class of medication is called anti-VEGF. This class includes Avastin, Eylea, and Lucentis. Anti-VEGF medication helps to reduce swelling of the retina, bleeding in the eye such as a vitreous hemorrhage, and can also stop abnormal blood vessel growth. This can slow vision loss from diabetic retinopathy and even restore and improve vision. Steroid medication is another option to reduce macular swelling. Steroids may be used in patients who do not respond well to anti-VEGF treatment. Laser surgery may also be used to help treat diabetic retinopathy in conjunction with anti-VEGF medication and steroids. This can reduce swelling of the retina or help stop abnormal blood vessel growth. Laser surgery can also help shrink blood vessels and prevent them from growing again. Often more than one treatment is needed. CAN DIABETIC RETINOPATHY LEAD TO BLINDNESS? Diabetic retinopathy can lead to blindness. It is important to be seen routinely for diabetic eye exams so diabetic retinopathy can be monitored and treated before it leads to more serious complications.